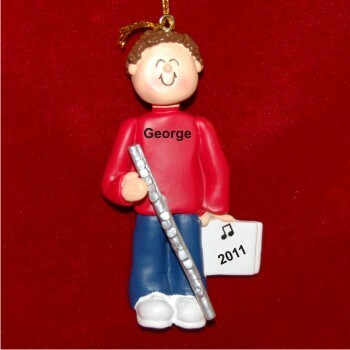 Show your support for your favorite flutist with the flute virtuoso male brown hair personalized Christmas ornament that arrives with a display cord in our attractive velvet gift pouch. It's one of a series of similar musical instruments ornaments personalized by hand in a handsome font. The good-looking male with brown hair flute player personalized Christmas ornament is available in blonde, African American and female versions.